Early Colonial History Of New South Wales (NSW) Australia is a website designed by Author and Historian Cathy Dunn. As one might expect, she has tremendous experience in researching historical facts. Cathy has designed a site that is user friendly and provides a wealth of information regarding New South Wales Australia. Providing information on the easiest way to research aboriginal roots, conservation advice, Heritage tours, and several extracted indexes. Includes references to the primary records such as the Sydney Gazette, Inquest details and shipping records and others." Information included in the indices are the location, first and last name, burial and death dates, some also include the name of the parents if the person that died was a child. If the decedent was a convict, often there is information regarding the crime with which they were charged. If you have ancestors from New South Wales and/or Norfolk Island in Australia, this site may be able to provide you with information regarding ancestors. 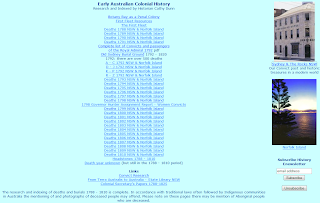 The Early Colonial History site of NSW click the New South Wales and Norfolk Island Indices. Even if you do not have Australian ancestry, it is interesting to read through the various indices. Have fun!